Distribution Components | Exalto Emirates LLC. 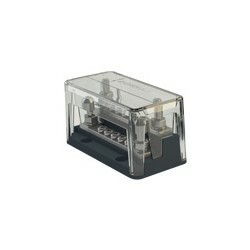 The 708 links are designed for space saving interconnections of terminals when battery distribution modules are linked together. Four standard solid links are available for interconnection of the 701 battery switch with other battery distribution products and two larger links which are intended for the heavy-duty battery switch. 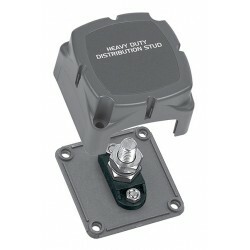 The contour distribution stud allows terminating of heavy-duty cables for one or more connections. 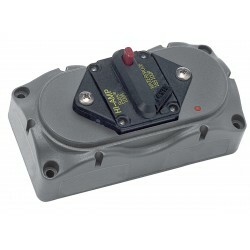 Contour lock housing has removable side plates which allows for connections from all sides. 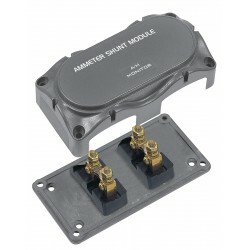 Designed specifically for transom areas for connecting batter cables from outboards. 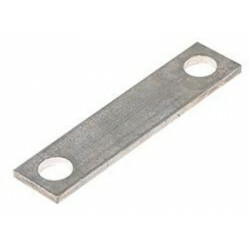 It also has many other applications where heavy-duty positive and negative connections need to be terminated. 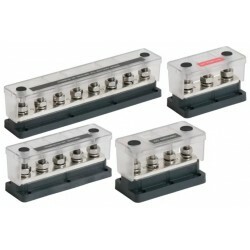 The 704-4S was designed for multiple heavy-duty connections which need to be isolated from each other. 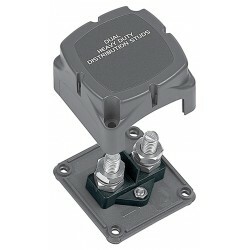 This model completes the range of heavy-duty connectors and meets ABYC standards for exposed terminals. 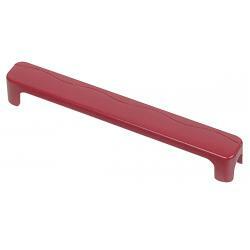 Provides 3 CBs ideal for medium duty loads, like waste treatment systems and electric toilets. Designed to separate these loadings from the main dc panel, avoiding voltage spikes. 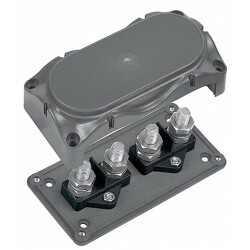 Supplied standard with 1 x 50A and 2 x 25A B series CBs in a contour lock housing for easy modulation. Extra CBs available (119). Labels ordered separately: SET-714.The patented contour locking system is an innovative feature that allows for multiple battery management components to be connected to each other providing for a clean finished installation. 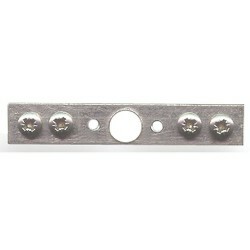 These locking tabs can be found on battery switches, heavy-duty buss bars, fuse holders, distribution studs and breaker modules. 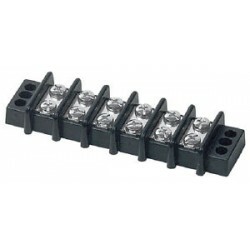 Consists of one 5A and three 15A push to reset Carling CLB Series thermal CBs. 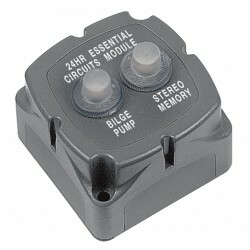 Suitable for essential circuits such as bilge pump, auto float switch supplies and stereo memory circuits. The push to reset function ensures essential 24hr circuits cannot be switched off inadvertently. This is contained in the contour lock double module. 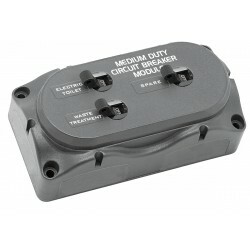 For spare circuit breakers see 120. Labels: SET-714.|The patented contour locking system is an innovative feature that allows for multiple battery management components to be connected to each other providing for a clean finished installation. 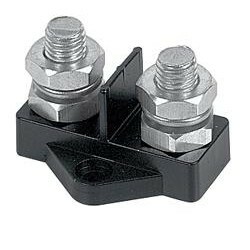 These locking tabs can be found on battery switches, heavy-duty buss bars, fuse holders, distribution studs and breaker modules. Allows switchable protection for heavyduty circuits like Windlasses or Davit winches using Busman heavy-duty thermal circuit breakers (120). Modular sizing with contour lock housing allows easy grouping. LED to indicate circuit is on. Five standard ratings available.The patented contour locking system is an innovative feature that allows for multiple battery management components to be connected to each other providing for a clean finished installation. These locking tabs can be found on battery switches, heavy-duty buss bars, fuse holders, distribution studs and breaker modules. 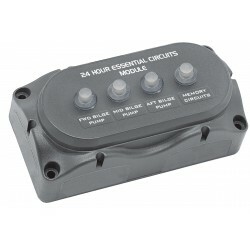 Designed for smaller systems where only 2 circuit breakers are required. Supplied with 2 x 10A Carling CLB Series circuit breakers &ndash; push to reset.The patented contour locking system is an innovative feature that allows for multiple battery management components to be connected to each other providing for a clean finished installation. 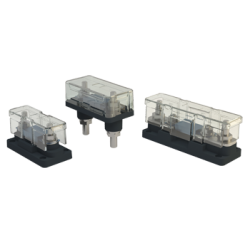 These locking tabs can be found on battery switches, heavy-duty buss bars, fuse holders, distribution studs and breaker modules.